Bespoke Shaker Cabinet Doors Designed & Made For Your Ideal Kitchen. Shaker doors are perfect for entirely new kitchens, and are also an ideal solution for kitchens that could do with a pick me up. Their simple panelling and clean lines can create a classic look that speaks to cleanliness, simplicity and order. This minimalist style naturally lends itself to customisation, meaning your shaker doors can be designed in a way that perfectly complements your specific kitchen. A bespoke door is literally made to measure. The result is that satisfying feeling you get when a door fits its frame perfectly. And there’s nowhere that’s more important than in a kitchen full of breakables! When you choose to commission a bespoke shaker door, you can style it in virtually any way you want. This means, if you have a pre-existing look to your kitchen that you’re seeking to extend or complement, we can easily accommodate your needs. Ironmongery can supply the perfect finishing touches to your bespoke cabinet doors. We are able to provide ironmongery to suit all your requirements, from handles to hinges. We can match almost any paint colour perfectly, meaning if you have something particular in mind, we can accommodate it. Alternatively, we can use waxes, oils and more to bring out your shaker door’s natural beauty. The use of glass in kitchen cabinet doors has its technical and safety challenges, but our experienced partners are able to handle those considerations for us. The benefits of glass are well known: it makes a room lighter, gives it a clean look, and is particularly useful for organisational purposes. 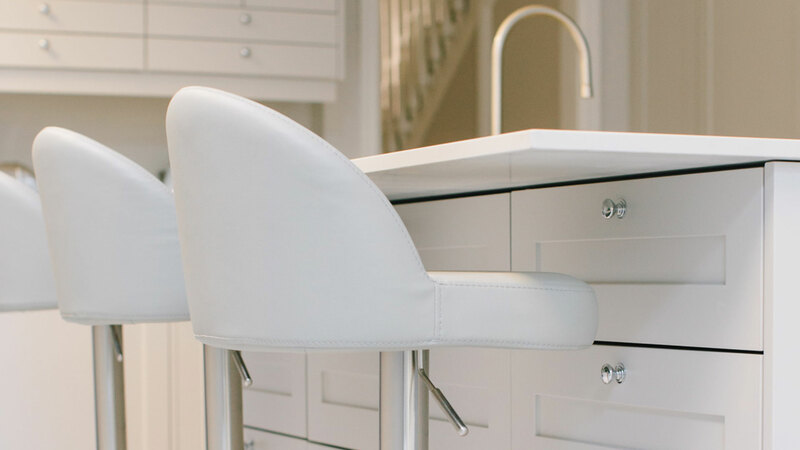 Our wider joinery capability means that we can not only create beautiful bespoke doors for your kitchen cabinets, but offer a wide variety of further cabinet joinery services. These might include making the cabinets themselves, providing custom made joinery fixtures like plinths, pelmets, scribe and end panels, creating kitchen features like islands or butchers blocks, or providing you with timber worktops. Foxstow began as a general joinery, making a wide range of commercial and domestic joinery products. And, although our reputation for exceptional timber doors eventually led us to specialise in the field of bespoke door making, we still operate a general joinery service capable of supporting our cabinetry and wardrobe door projects. This means that we can make more than just great doors for your cabinets, cupboards, and wardrobes – we can make the entire piece of furniture, if necessary. And, we can also make the whole suite of supporting accessories, such as drawer fronts, wine racks, butchers blocks, and much, much, more. 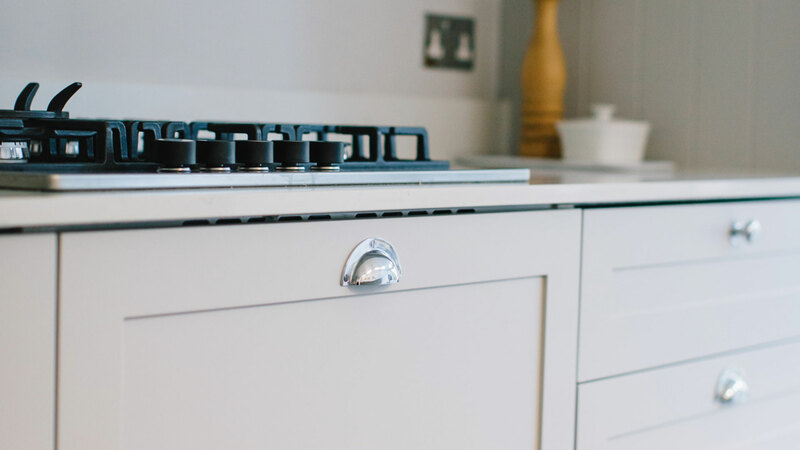 have inherited a fitted kitchen during a house move, or have simply fallen out of love with your pre-existing fitted kitchen, the addition of bespoke made cabinet doors can breathe new life into it. Alternatively, you may be planning to buy an entirely new fitted kitchen, and want to make the most of it with outward-facing improvements. This approach gives you the benefit of fitted kitchen functionality and prices with a fully bespoke appearance. Foxstow has a great deal of experience with both scenarios. Shaker doors are unique because they are representative of the panel door at its purest and most basic form. However, you may have other styles of panel door that are representative of different historical periods (such as Georgian or Victorian), in mind for your kitchen. We can work with any of these styles, as well as flush doors and traditional ledge and brace doors. 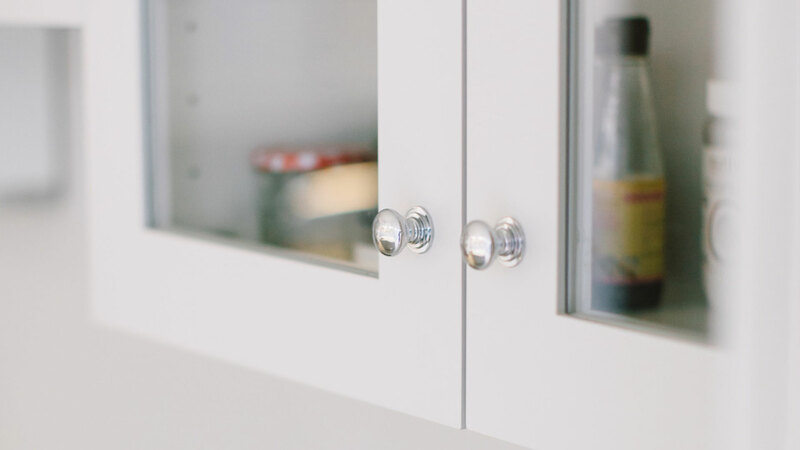 If you have any other designs in mind for your kitchen cabinetry, please visit our main site to learn more about the door making services we offer. Because all of our doors are made to bespoke requirements, we do not have any ‘off-the-shelf’ kitchen cabinet doors available. However, we do have a gallery of our most popular types of shaker door, which can be created extremely quickly. Our gallery also includes pricing information, to help you get a handle on how much your bespoke door may cost you. Please don’t mistake this for ‘everything we can do’. Given the wide range of kitchen cabinet options available to our customers, it is simply not possible to provide such a comprehensive guide – therefore, consider this a starting point for your own bespoke door project.